A German air force Tornado jet takes off from the German army Bundeswehr airbase in Jagel, northern Germany December 10, 2015 (Reuters Photo). Despite media reports that Turkey and Germany reached a de facto compromise for Germany to set up military facilities at İncirlik Air Base, sources told Daily Sabah that an agreement has not been finalized and work is being carried out in light of the current diplomatic climate in bilateral relations. Bilateral ties suffered after German parliament passed a resolution describing the 1915 incidents concerning Armenians as genocide. Citing a Defense Ministry spokesman, a report by Deutsche Welle (DW) on Friday claimed the two countries had agreed on basic issues and talks are ongoing on the "Turkish-German Technical Arrangement Agreement" to regulate work regarding German planes and personnel at the air base. The sources said Germany's demand came before the lower house of German parliament approved a non-binding resolution on June 2 that recognizes claims of genocide on Armenians concerning the 1915 events, but discussions have not shaped a finalized agreement. They said that Turkey will consider this issue with the latest political developments in bilateral relations, and work is still being carried out. Citing sources in Ankara, Turkish media reported Germany aims to make this issue a fait accompli and the problems for a possible agreement, whose discussions are carried out by the coordination of the Foreign Ministry and National Defense Ministry, have not been removed yet. The sources also said that the Turkish Armed Forces (TSK) is cool toward opening the air base for the German initiative. The air base is located in southern Turkey east of Adana close to the Mediterranean coast. Ankara has allowed the U.S. to use it for its Syrian campaign against Daesh on the condition that it would not be used to support PKK-affiliated groups in Syria. Saudi Arabia has a presence at İncirlik as well. When asked about stories in the German media that Berlin was seeking a base near İncirlik, President Recep Tayyip Erdoğan said, "Such matters depend on developments. As a NATO member, such deployments benefit us. Germany or France building such a thing near İncirlik could benefit us, we should not forget," but added that such matters can only happen with Ankara's permission. 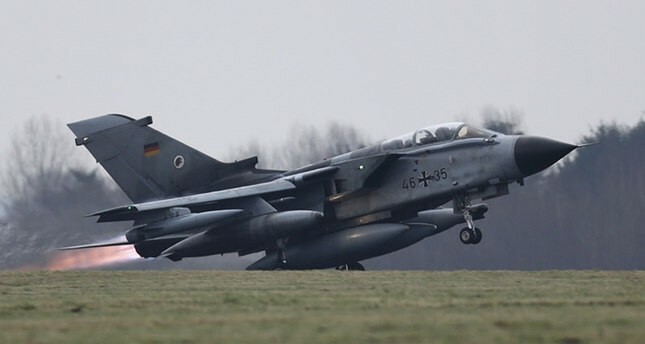 As Daesh continues to threaten the international community, Germany deployed four additional Tornado surveillance aircraft as well as nearly 100 military personnel to the İncirlik Air Base in January. In mid-December 2015, Germany sent two Tornado aircraft following parliamentary approval of a military operation as part of the U.S.-led international coalition against Daesh militants in Syria. In December, the German Federal Parliament approved a one-year support commitment for the coalition, which includes up to 1,200 troops, six Tornado surveillance aircraft, a refueling aircraft and a Bremen-class Augsburg frigate to support a French aircraft carrier in the eastern Mediterranean. Additionally, for 2016, Germany's mandate for anti-Daesh operations as part of the international coalition is to cost around 134 million euros.